The ClipsShop® CS-TIDY-41 Pneumatic Grommet Machine is a compact unit that is designed to accurately attach metal grommets from #XX00 to #5.5 using a foot pedal or a top-mounted push-button. Fully portable, this lightweight industrial-duty press features a new EyeleD™ pointer to safely identify reference marks or precut holes for rapid alignment. Consuming very little power and eliminating the health risks and expense of laser-type pointers, the EyeleD™ pointer is powered by 110VAC or 2 AA 1.5V batteries. The ClipsShop® CS-TIDY-41 Pneumatic Grommet Machine weighs just 15 lbs., has a convenient carrying handle, is powered by standard shop air and can be setup for right- or left-hand operation. Applications include banners, curtains, draperies, tarpaulins, and more. 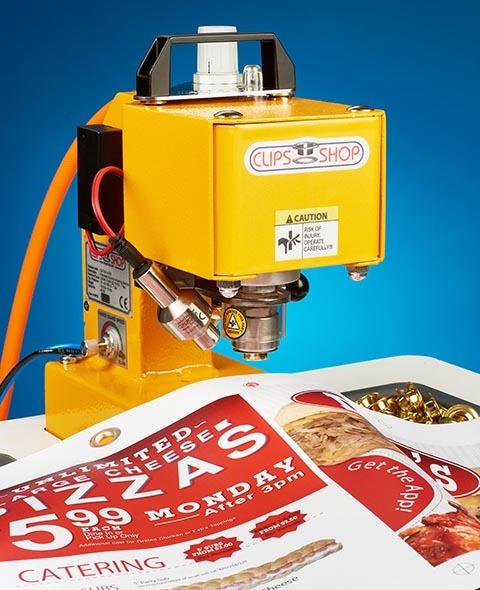 The ClipsShop® CS-TIDY-41 Pneumatic Grommet Machine is priced from $895.00 (list). A broad range of productivity-enhancement accessories are available and dealer inquiries are invited.